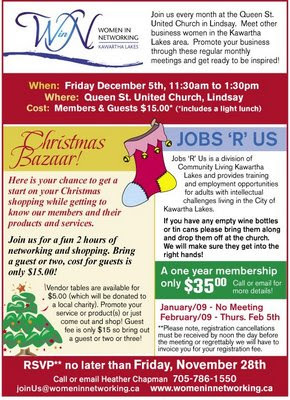 Friday, Dec 5th is our annual Christmas Bazaar, see flyer below. 1. Please let me know as soon as possible if you are interested in a vendor table and/or if you will be attending. 2. New Members: For those of you who joined last month, if you could forward me your contact information, email address and website (if applicable), as I will be updating the WiN website this week. 3. Please, please, please, bring in your empty wine bottles and tin cans. This is a new endeavor that WiN would like to carry out on a monthly basis (see flyer for more details). Barb Smith & Twila DelFatti - Silver Connections Inc.